The knurl and collar of a Pendlay Nexgen Barbell. Let me start out by saying; I own an original Pendlay HD bar, I have used the latest versions of the Pendlay Nexgen Bushing bar, I have used York Elite, DHS needle bearing, Eleiko competition and training bars extensively. I have an expert base of experience when dealing with bars. On any given training day I could encounter a Pendlay bushing or bearing bar, a DHS competition bar, a TKO bar, or a commercial gym bar. Let's start out with the positives. For the money ($550 USD approx), it is a great bar. 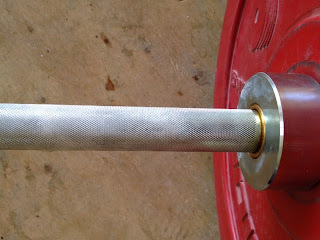 No complaints about the spin or the knurling. Some people like center knurling but I don't for training. The whip of the bar is adequate. The only negative aspect I can complain about is how the shaft can bend. I have bent my second shaft on my Pendlay needle bearing bar in less than 6 months use. MDUSA was great in replacing it at no charge, but then soon enough I bent the second one. I thought this was a one off story until I found other complaints on the Pendlay forum similar to mine. I don't do anything crazy, so there is no reason the bar should have bent. My platform is more forgiving than most. And I haven't even attempted PR weights on this bar. Bang for your buck, the Pendlay needle bearing bar is a good product. If the manufacture figures out the shaft bending problem it could be a great bar.